20’ DuraTech SRL is a fully-featured block with galvanized steel cable and CNC machined aluminum housing and drum. The internal brake is constructed with a hard-wearing bronze ratchet center and pawls with an alloy steel pressure plate. 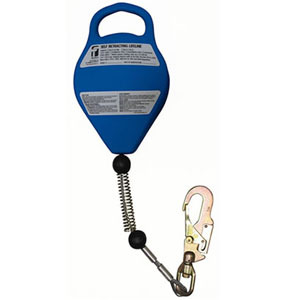 Also features the DuoTech load-indicating snap hook for attachment to the back D-ring of your full body harness. •3/16” Galvanized steel cable has a tensile strength of 4,000 lbs. •Aluminum housing and drum are durable, lightweight and resistant to corrosion. •Housing features built-in carry handle. •High-strength aluminum-alloy main shaft for lighter weight. •Spring and ball buffer assembly prevents lock-up from free-wheeling. •Includes free tag line to prevent free-wheeling. •Fully serviceable, re-certification required every two years. •Reduces arrest forces to less than 900 lbs. •Meets the requirements of OSHA 1926 and ANSI Z359.